hocolate. There are few foods that people feel as passionate about -- a passion that goes beyond a love for the "sweetness" of most candies or desserts: after all, few people crave caramel, whipped cream, or bubble gum. Chocolate is, well, different. For the true chocoholic, just thinking about chocolate can evoke a pleasurable response. You may want to grab a bar or make a nice cup of hot cocoa before you begin exploring here. This special online-only edition of Exploring takes a closer look at the sweet lure of chocolate. We'll examine the fascinating -- and often misreported -- history of chocolate, follow the chocolate-making process, and take an online visit to a chocolate factory. We'll also look at the science of chocolate, and find out about the latest research into the possible health effects of its consumption. Lastly, we'll explore the somewhat controversial question of why chocolate make us feel so good. In this activity, you'll learn about "tempering" -- a delicate process of melting and cooling chocolate that not only produces delicious results, it's also an opportunity to learn a little science! 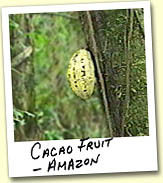 A visit to the Amazon, a source for chocolate. The Olmecs, the Mayans, and the Aztecs. Take a video tour of the Scharffen Berger chocolate factory. Can chocolate help prevent heart disease? More than a food, but less than a drug.